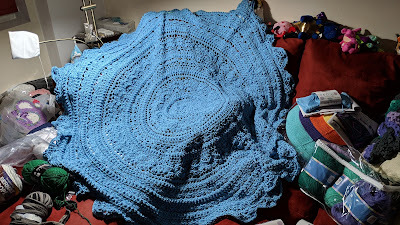 Knit a baby blanket, it won't take that long and you can practice your knitting. That's what I thought 2 weeks ago. Now I'm on the 3rd skein of yarn, but on the last page of instructions. 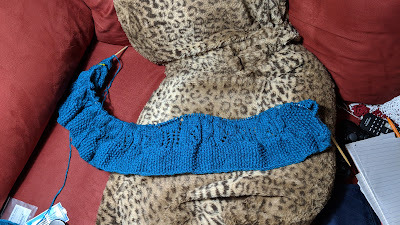 At least I can call myself an intermediate knitter. 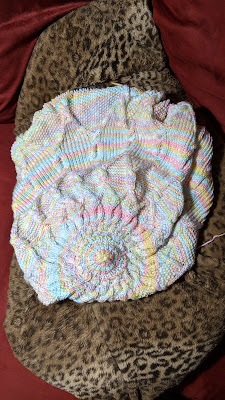 So, I managed to make it to the 2nd length of circulars. I was going to switch again with the last increase, but now the stitches are gliding better and I still have some room. 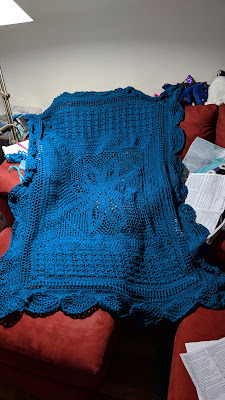 So, I finished the Annie's Lace throw tonight. Tada! Anyway, thought this was cool while working on the throw. I know it was standing up, but I got pretty close to the end before the tunnel collapsed. And here are the other two kits from HAED. Soul Mate (aka Clyde) and It's Only Forever SSMC (aka Labyrinth). I love the little bag on the left and the green threader is my favorite of the three. I actually have 3 copies of this pattern and all of them still had the same error on the first strip, so I'm second guessing things that look odd. Finally got through, but I really don't feel like dealing with 3 more strip 3s (the one with the squares). 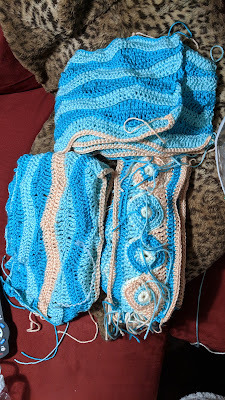 (side note, I'm already dreading the number of ends on the strip) So I switched projects. This is the start of my Annie's Lace Throw. And here's a close up of Clyde. 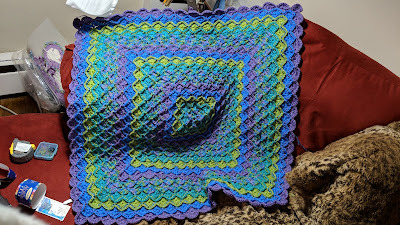 Another afghan finished. It was a little boring at the end due to the repetitiveness, but it was still small enough that I toughed it out without switching projects. 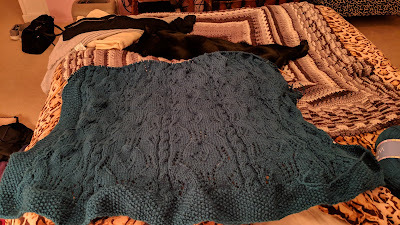 So, did a swatch of the marcelle afghan with a smaller hook and have decided to frog the entire thing and start over. 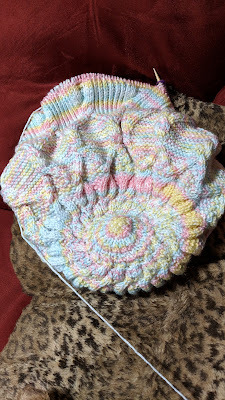 I had another that was in progress that I was having issues with gauge that I contemplated. Got some stash. One of the kits from HAED. Remote for size on the package. Free gifts of a needle threader and needle case. This is for Secret Carousel MC. Given the size of this, I can only imagine what the SSMC I ordered will look like. Also got some pretty fabric. Not quite sure what no background design will go on them, but the one on the right is sparkly. 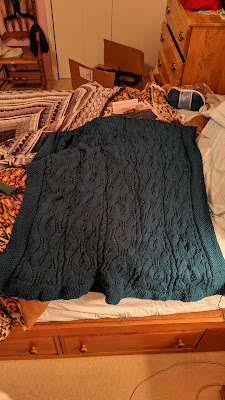 Just 5 more rows of the Bavarian stitch before the border. Messed up a bit on the last blue round and fudged it with the purple. Had already frogged two previous rounds to redo some less fudgeable mistake. And I didn't feel like frogging. My new shower curtain. Hehe. 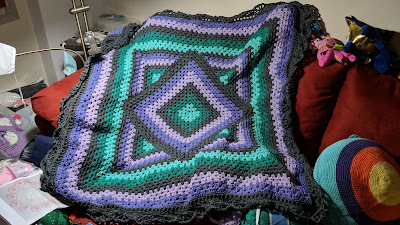 1 week is much more normal for me to finish an afghan. Love how quick my crochet is. And Clyde in a box top. Finally finished. I don't think there are any major mess ups in the pattern. So I can now declare myself an intermediate knitter. At least in terms of following a pattern. Don't have cast-ons memorized yet, but that's what google's for. Now back to my crochet to get something done in a reasonable amount of time. And back in my apartment now that my bathroom is done. Yay! First, it's folded because it's too long to really get a good photo of. Second, I'm finally on the last repeat of the pattern. 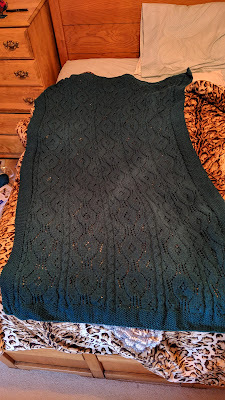 I have that, a partial, and then 18 rows of seed stitch and I'm done with this. Back to my crochet for a while. 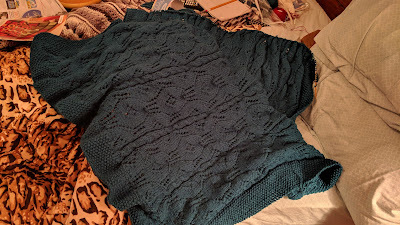 Over 50% done and onto the third ball of yarn. Yay! I've kind of figured out why this is taking so long, it's the equivalent of doing a blanket in single crochet. 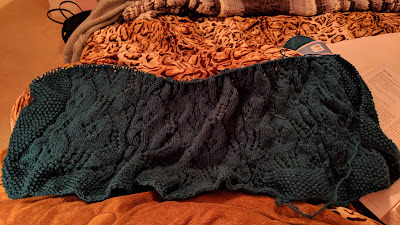 Knitting has not way (that I've seen so far) of adding height to stitches to make it go faster. Random photos of Clyde who has decided he doesn't like my bed after the two days he slept with me. And I don't know why, but I bought 3 material packs from HAED because they had a sale... Soul Mate, SSMC It's only forever, and a last minute impulse because it got added, Secret Carousel MC. Progress after starting the 4th repeat of the pattern. You can see Clyde above who has finally decided he likes laying on my bed with me. So, I knew knitting something would take longer than the equivalent crochet, but didn't think it would be this slow. Thankfully the 2nd repeat seems to have taken less time. But I still have 9 more to go. Good news, lots more Clyde photos. I've been here two days and he's still unsure of what to make of me being in his house this long. So far he's only on my bed (on the afghan that I have repeatedly said was not his) when I'm not home. I was sitting on the floor putting something together for my parents so Clyde was watching me from the chair. At the time, he was looking at my mom during a moment of distraction. 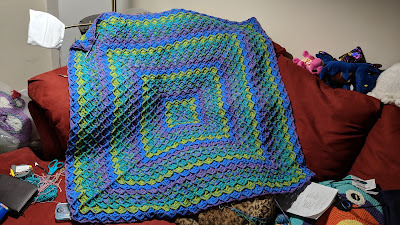 So a little late with this post because I thought I might get farther on this afghan. It took me 2 hours to do one row at this point. I have 2 more to go and am probably going to lose at yarn chicken. 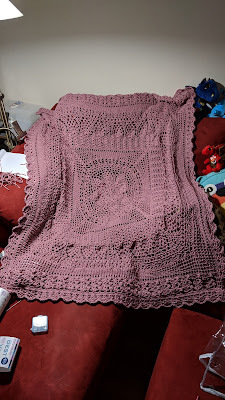 I will then put this away until I get the skein, but I'll wait until I know I need more than 1 item from Mary Maxim. 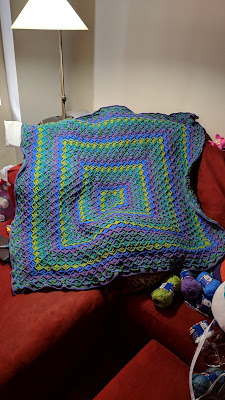 I usually have more yarn leftover on projects. My gauge was just a hair larger than suggested so I didn't go down a hook. Did that extra 1/8" snowball that badly? Clyde claims all boxes, even those that have not been opened yet. Above is my final 2018 finish, below is my start of 2019. Bonus, Clyde wondering why I'm taking his picture again on New Year's Eve.